PRS Foundation’s New Music Biennial Residency programme, which has been taking place throughout 2017 as part of Hull’s City of Culture year, is to continue in 2018. The innovative programme sees leading musicians and composers making music alongside local communities. It has already brought folk legends Sam Lee and Eliza Carthy, classical composers Errollyn Wallen and Brian Irvine and beatbox/electronic artist Jason Singh to Hull, where they have been creating new work alongside local community participants and other talented local musicians and composers. Most recently, acclaimed composer and musician Hannah Peel has been working with a group of singers from Hull Freedom Chorus and Hull 2017 volunteers. PRS Foundation mentor and composer James Redwood has been working with a team of composers and creative musicians across community groups in Hull to create a new body of work, Songs of Flight. 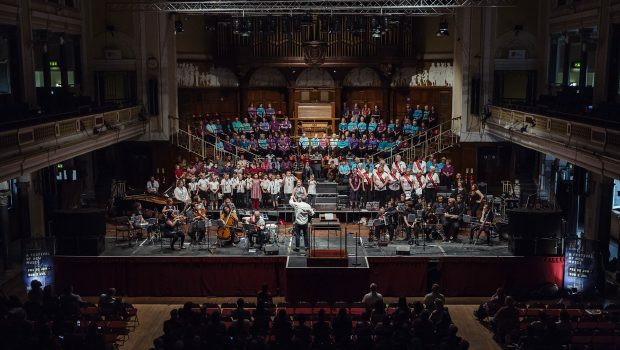 The work, built on the theme of bird migration, will be performed by massed voices, a range of participating music groups and the City of Hull Youth Symphony Orchestra at Hull City Hall on 20 April next year. The performance will be presented in partnership with Hull Music Service (Music Hub) and the City of Hull Youth Symphony Orchestra. Before performing at Substance Live at the weekend, Hannah Peel began a composer residency working collaboratively with local singers to start creating a piece of music that will feature as part of Songs of Flight. This December Brian Irvine has been working with a group of formerly homeless people at the Crossings in Hull. This culminated in a recording day last week where Brian Irvin led the group in a recording session of a range of songs created with residents of The Crossings, with the support of professional musicians. This builds on his residency earlier in the year. At the end of January, Brian Irvine returns to Hull for a project working with local schools to create a set of songs that will be shared in a private performance in March 2018. On 18 January, a second free continual professional development programme for local music leaders launches in Hull. Led by James Redwood a series of three days of training is offered to local musicians and music leaders who want to develop their practice making music with groups. The other two dates are 23 February and 23 March. Martin Green, Director of Hull 2017, said: “Hull has a vibrant and creative scene and the PRS Foundation’s residency work, alongside its stunning New Music Biennial weekend in the summer, has created some amazing opportunities and memories for people in the city. “The collaborative new work is not only a testament to the quality of composers and musicians in the UK, but also the talent in Hull. “Working together, the project and musicians have created incredible new music paying homage to Hull’s history, heritage and culture. Vanessa Reed, CEO of PRS Foundation said: “When we were planning the New Music Biennial residencies with communities in Hull, we always hoped to support ongoing music-making opportunities after the official City of Culture celebrations had come to an end. “Thanks to our collaboration with Paul Hamlyn Foundation, Hull City Council and the City of Culture team, it’s now exciting to see this plan come to fruition with fantastic composers like Brian Irvine, Hannah Peel and James Redwood coming back to Hull to compose music with local talent. Local musicians and composures contributing to the residencies include Em Whitfield Brooks, Sam Pirt, Cecil Jones, Gabrielle Awre, Mambo Jambo, Benjamin Newton, Gary Hammond, Tom Lawrence, Wes Finch and Andrew Melton.